The legendary Isle of Man TT is one of the fastest, most demanding and most spectacular sporting events in the world, and in 2009 speeds hit an all-time high. Now you can experience all the excitement and drama for yourself with the Official DVD Review, an action-packed and comprehensive look back at the fastest TT ever. The TT, first run in 1907, remains one of the most challenging and iconic motorsport events on Earth. Every year the finest motorcycle racers descend on the Island in the middle of the Irish Sea to test their skills around the 37.73-miles of closed public roads, where speeds top 190mph just inches from houses, walls and hedges. Over almost four hours of comprehensive coverage, the Official Review brings you breathtaking action footage as records tumble over the legendary TT Mountain course in every single class. Produced for the first time by North One Television, the TT 2009 review offers unrivalled coverage of this unique event. There’s more on-board cameras with leading riders than ever, letting viewers experience the incredible 37.73-mile circuit from the rider’s point-of-view. Plus, the Hi-Motion camera captures spellbinding ultra-slow motion sequences which demonstrate exactly how much skill and courage it takes to control 240bhp Superbikes at speeds in excess of 190mph. The Official Review rounds up all the practice week action, including Australian Cameron Donald’s stunning unofficial lap record and his TT-ending practice crash – complete with postsmash interview. There’s complete coverage of every race over the Mountain course, including an incredible 15th TT win and new outright lap record of 131.578mph AVERAGE lap speed for John McGuinness. There’s also a popular double for Yorkshire’s Ian Hutchinson, an emotional return to the top step of the podium for the Dunlop name and an unexpected, but thoroughly deserved, victory for Steve Plater in the blue riband Senior TT. The review also records a stunning 14th TT victory for sidecar legend Dave Molyneux during a TT packed with emotional highs and lows for the three-wheel crews. Incredible camera angles, aerial footage and on-bike action are skilfully combined to bring you the full story, with informed commentary from ex-racers Steve Parrish and James Whitham keeping you fully up to speed. Plus, the Official Review takes you on-board at the Lightweight and Ultra Lightweight TT races – held on the 4.25-mile Billown Circuit – and takes a look at the inaugural TTXGP. This was the first-ever race for clean emission motorcycles, putting the Isle of Man TT back at the cutting edge of racing technology and making headlines around the world – the Official Review’s special feature explains why TTXGP was such an important and ground-breaking achievement. As ever, the TT attracted some famous fans and the Official Review features two of the biggest. There’s an interview with legendary ‘Voice of Motorsport’ Murray Walker O.B.E. and the historic lap by MotoGP great Valentino Rossi, the reigning World Champion taking a break from his busy schedule to achieve an ambition held since childhood – lapping the TT course. 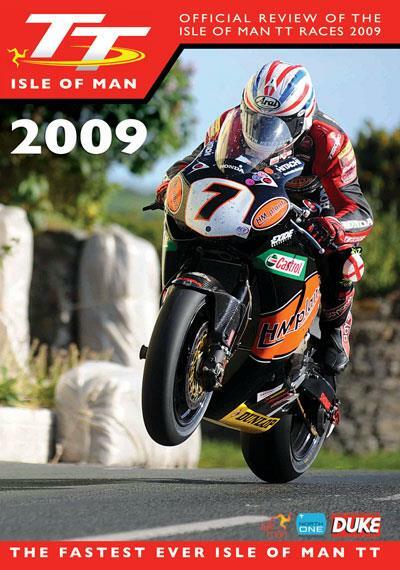 The Official Review of the 2009 Isle of Man TT is due for release on July 27th, but you can enjoy a sneak preview of this stunning DVD now by visiting http://www.dukevideo.com/Isle-of-Man- TT/TT-DVDs/Events-2000-onwards/TT-2009-Review-DVD.aspx and clicking on the ‘watch’ link. For the first time ever, the Official TT Review will also be available in High Definition on Blu-ray Disc, bringing the event to a whole new generation of fans. The Blu-ray release is scheduled for mid-August and further information about this latest innovation in TT viewing will be announced nearer to the release date. Tel 01624-640000, fax 01624 640 001 or email mail@dukevideo.com.